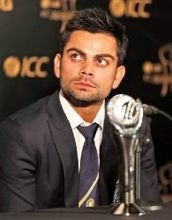 Virat Kohli pronunciation (born 5 November 1988 in Delhi) is an Indian international cricketer. He is a middle order batsman, who can also open the batting. He can also bowl right arm medium pace. Kohli was the captain of the victorious Indian team at the 2008 U/19 Cricket World Cup held in Malaysia. He represents Delhi in first-class cricket and is the captain of Royal Challengers Bangalore franchise in the Indian Premier League. He also played for the West Delhi Cricket Academy. He made his One Day International (ODI) debut in 2008 and was part of the Indian team which won the 2011 World Cup. Despite being a regular in the ODI side, Kohli only played his first Test in 2011 against West Indies in Kingston. But on the disastrous 2011/12 India tour of Australia, in which India's senior batsmen struggled throughout, Kohli stood out, scoring his first Test hundred in Adelaide. Kohli was the recipient of the ICC ODI Player of the Year award in 2012. 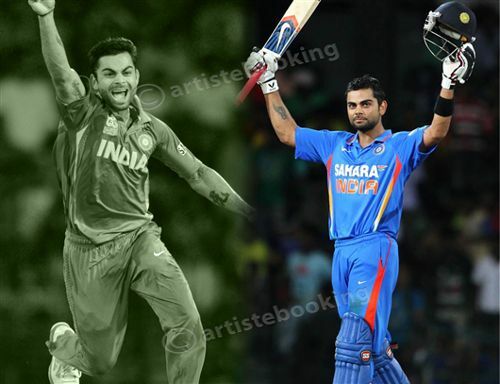 Why Book Virat Kohli Through ArtiseBooking?